By Krista Schwimmer As part of March’s “Women’s History Month”, the National Women’s History Project (NWHP) has announced as its theme for 2014: “women of character, courage, and commitment.” There are many ways to honor such women. My favorite way is by reading their stories – through novels, biographies, poetry, and more. 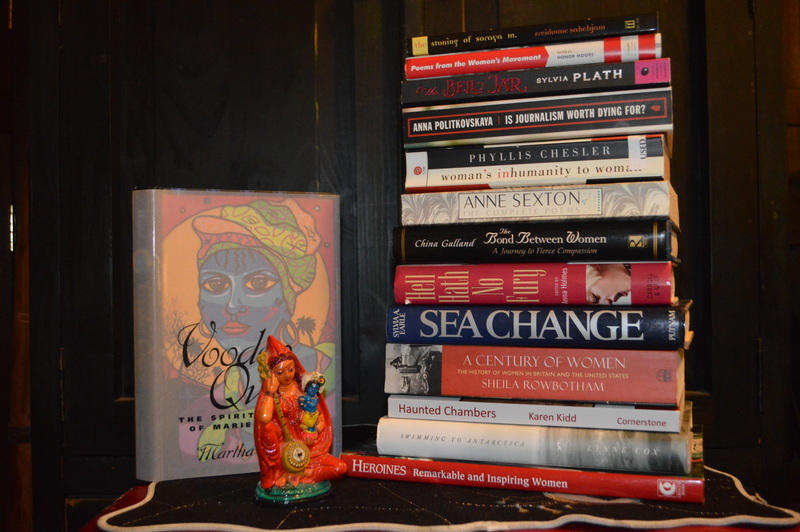 Having worked in bookstores for years, I have collected a diverse group of books by and about women, many of which I have not had time to read yet. So, I rummaged through my library to see what I could find to celebrate this theme. My first pick is the 50th anniversary edition of Sylvia Plath’s “The Bell Jar.” Plath, along with Anne Sexton, deeply influenced me in my twenties when I found myself still coping with deep loss. Although many judge these two confessional writers more by their suicides than their ground breaking works, I have continued to admire them for their shattering works, as well as their obvious commitment to their craft. Having delved a bit more into community politics recently, my next pick is a book I bought a few years ago at Small World Books. (They always do a wonderful job showcasing a variety of women-themed books in March.) The book is called “Is Journalism Worth Dying For?” by Anna Politkovskaya. A special correspondent for the Russian newspaper Novaya gazeta, this journalist received many awards before her murder in Moscow on October 7, 2006. In a similar vein, I have also begun to read, “I Am Malala: the Girl Who Stood Up For Education,” written by Malala Yousafzai and Christina Lamb. I am sure many of you know of this amazing, courageous young girl who was shot in the head by the Taliban in 2012 for fighting for girls’ education. Luckily, however, she survived to inspire us all! The next books I pulled out, I have already read – I simply wanted to hold them again! Since I was young, I have also looked for women physically courageous. My interest in the ocean led me to two fascinating women. The first, Sylvia Earle, ranks up there with Jacques Cousteau. A marine biologist, deep sea diver, and ocean activist, Earle was a pioneer in her field. Did you know, for instance, that in 1970, she and a team of female aquanauts lived underwater for two weeks? I highly recommend Earle’s book, “Sea Change,” if you want to read more about her. My second favorite aquatic woman is Lynne Cox, a long distance ocean swimmer who, at fourteen, swam the twenty-six miles from Catalina Island to the California mainland. And that was just a start! The book I have, “Swimming to Antarctica”, recounts her one mile swim to this icy region without a wet suit. As March also celebrates “International Women’s Day,” I have pulled from my crowded shelves an interesting looking history book I bought year’s ago, at the Bodhi Tree Used Bookstore for just $8.50. This 580 page book, “A Century of Women: the History of Women in Britain and the United States, “ by Sheila Rowbotham looks quite daunting! The little bit I have read so far, however, tells me it is quite readable, with delightful black and white illustrations, as well as a sixty-five page list of the biographies of the women included in her history. Looking back at my list, I realize that I may need to balance my reading with a little levity. Luckily, I found just the book for that! How can any woman resist, “Hell Hath No Fury: Women’s Letters from the End of the Affair,” edited by Anna Holmes? This well-researched book is a collection of real and fictional letters from women across the centuries. Divided into sections such as “The Tell-Off”, “The Dear John”, and “The Goodbye Letter,” this book makes me wish I had written more letters to the men who broke my heart when I was young. To my delight, there are so many books from my own library that fit this year’s theme. Books about magical women such as Dion Fortune, who single-handily shaped the Western Occult Movement or Marie Laveau, Voodoo Queen extraordinaire who still influences people from her New Orleans’ grave; biographies of women writers such as Mary Shelley, the creator of one of the most iconic monsters, Frankenstein, and Anna Akhmatova, the tremendous Russian poet who lived and wrote under the shadow of Stalin-ism; and stunning art books by such icons as the surrealist, Frieda Kahlo, and the visionary painter, Susan Seddon Boulet. One month is simply not enough time to explore the lives of women of character, courage and commitment! I may have to extend it to a year! And so, without further ado, I must return to the books calling to me. Luckily, my husband accepts my bookish ways. I wish you all a wonderful month celebrating the lives of women, in whatever way suits your soul. May you find women who inspire in you to be even more than you ever dreamed you could be – no matter what your age, your race, your religion, or your economics. And for all of you girls and women out there – may you, too, become women of character, courage, and commitment.